Recently I have been experiencing difficulties loading pages on the internet. This problem occurs on all web-browsers that I had(IE, Firefox, and Google chrome.) It just happen recently for about 3 weeks now, and some days it run normally however on others it's just really slow. I have tried restarting my PC when it was acting slow but that did not solve the problem. This PC has been infected with lots of virus once like Internet Security 2010 but I removed them using MalwareBytes-AntiMalware. However I have seem to lost all my restore points so therefore I do not have a safe restore point I can restore my computer to. I also have a laptop at my house who is sharing the same internet router as my PC but it runs fine so I figured it was my Computer that is the problem not my router. I am using wireless network to connect from my PC to my router. I never have this problems where pages load really slow before so I do not know what do. Please if anyone could help me. Also, can you post a NETSTAT/B report? How about starting more basic, do a disc clean up and then a disc defragment. I tried Disk Clean up and Disk Defrag. but they seem didn't fix the problem. Do you run an mail server or do you use Outlook or Outlook Express or FireBird or any kind of mail server? Chances are you have it checking your mail too often which is eating up your bandwidth. Try adjusting it a little. Because your neighbors are sharing part of that band width. 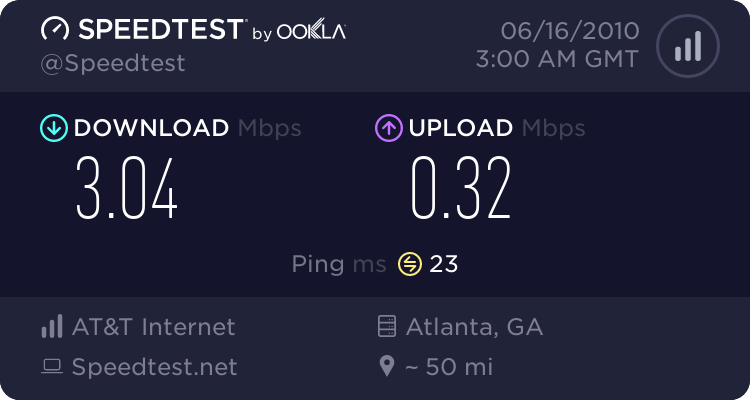 DSL does not have the same problem but it has problems with speed the further you get from the Main Office. Are you running some kind of monitoring software on your computer. You may have installed the CD that came with your ISP when you subscribed and it installed something on your computer that monitors it. Try uninstalling if that is the case. Which is not black listed but the fact that it has the word CRAK in the name is not a good sign. I have ran scan with MBAM but it found no malicious items. PS: The last link is the path to the first item found by SAS, it got cut off when I was taking the screenshot. Please see if these are any harmful items and tips on how to remove them permanently. I greatly Thank you all for all your help. Have no idea. You may want to post this to the Security forum. They would know. I still think your major problem is your ISP has monitoring software on it. Uninstall any of the stuff your ISP may have had you install when you first got setup. The cookies are no big deal, but they can be cleared from within your browser if you wish. Trojans are much more worrying and manual removals can be risky - it is rarely just one file. If SAS can remove them I would let it. Otherwise you need to Google the trojan name and see if there is anything out there designed to remove it (or offers a full manual procedure). The S&V forum is a good place to ask, as already given. Apparently what you have been using as a full time antivirus program is not sufficient. Remove everything that the recommended programs can and rescan with a few more just to be sure. After this, uninstall any program you do not specifically use in add/remove programs. Install Process Explorer (from microsoft) so you can see everything that is running on your system (in more detail than with Task Manager) so you have more control over your system. Then replace you antivirus program with a more reliable program and keep it up to date (save Malwarebytes and SuperAntiSpyware for spot checks).